Whether sided in shingle, brick, or clapboard, Shingle Style homes marked a significant shift in American housing styles. In 1876 the United States was celebrating 100 years of independence and a new American architecture. While the first skyscrapers were being built in Chicago, East coast architects were adapting old styles into new forms. Shingle architecture broke free from lavish, decorative designs popular in Victorian times. Deliberately rustic, the style suggested a more relaxed, informal style of living. Shingle Style homes could even take on the weather-beaten appearance of a tumble-down shelter on the craggy New England coast. In this photo tour, we'll look at the many shapes of Victorian Shingle Style and we'll offer some clues for identifying the style. The cottage-like appearance of simplicity is, of course, a strategic deception. Shingle Style homes were never the humble dwellings of fishing folk. Built in seaside resorts like Newport, Cape Cod, eastern Long Island and coastal Maine, many of these houses were vacation "cottages" for the very wealthy — and, as the new casual look caught favor, Shingle Style homes popped up in fashionable neighborhoods far from the seashore. The Shingle Style home shown here was built in 1903 and has seen world leaders from Britain, Israel, Poland, Jordan, and Russia. Imagine Russian President Vladimir Putin walking the grounds with a U.S. president. The rambling shingle-sided mansion overlooking the Atlantic Ocean is the summer residence of George H. W. Bush, 41st President of the United States. Located on Walker's Point near Kennebunkport, Maine, the property has been used by the entire Bush clan, including G. W. Bush, the 43rd U.S. President. Architects rebelled against Victorian fussiness when they designed rustic Shingle Style homes. Very popular in the Northeastern United States between 1874 and 1910, these rambling homes can be found anywhere in the U.S. where Americans are becoming wealthy and architects are coming to their own American designs. Naumkeag (pronounced NOM-keg) in the Berkshire Mountains of Western Massachusetts was the summer home of New York lawyer Joseph Hodges Choate, best known for convicting "Boss" Tweed in 1873. The 1885 house was designed by architect Stanford White, who had become a partner at McKim, Mead & White in 1879. The side shown here is really the "backyard" of the summer cottage for Choate and his family. What they call the "cliff side," the shingled side of Naumkeag overlooks the gardens and the landscaping of Fletcher Steele, with orchards, meadows, and mountains in the distance. The entrance side of Naumkeag, on Prospect Hill Road, is a more formal Victorian Queen Ann style in traditional brick. The original cypress wood shingles have been replaced with red cedar and the original wood shingle roof is now asphalt shingles. A shingled home does not stand on ceremony. It blends into the landscape of wooded lots. Wide, shady porches encourage lazy afternoons in rocking chairs. The roughhewn siding and the rambling shape suggest that the house was thrown together without fuss or fanfare. In Victorian days, shingles were often used as ornamentation on houses on Queen Anne and other highly decorated styles. But Henry Hobson Richardson, Charles McKim, Stanford White, and even Frank Lloyd Wright began to experiment with shingle siding. The architects used natural colors and informal compositions to suggest the rustic homes of New England settlers. By covering most or all of a building with shingles stained a single color, architects created an unembellished, uniform surface. Mono-toned and unornamented, these homes celebrated the honesty of form, the purity of line. The most obvious feature of a Shingle Style home is the generous and continuous use of wood shingles on the siding as well as the roof. The exterior is generally asymmetrical and the interior floor plan is often open, resembling architecture from the Arts and Crafts movement. The roof line is irregular, with many gables and cross-gables hiding numerous brick chimneys. Roof eaves are found on several levels, sometimes morphing into porches and carriage overhangs. Not all Shingle Style houses look alike. These homes can take on many forms. Some have tall turrets or squat half-towers, suggestive of Queen Anne architecture. Some have gambrel roofs, Palladian windows, and other Colonial details. 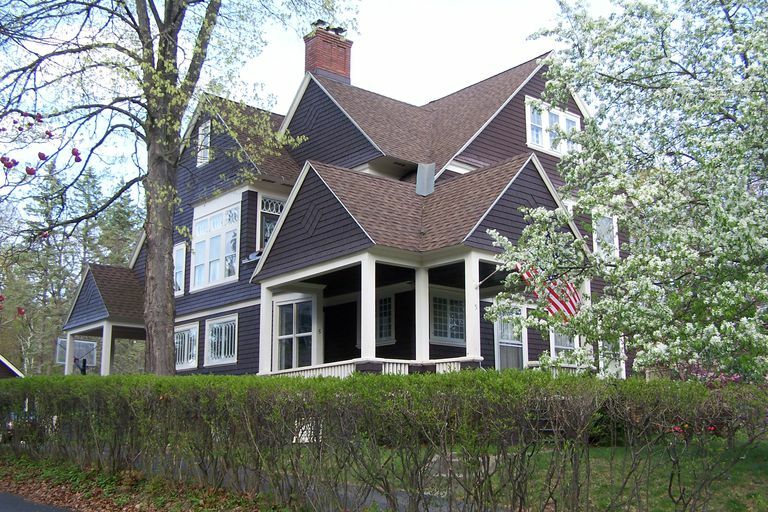 Author Virginia McAlester estimates that a quarter of all Shingle Style homes built had gambrel or cross-gambrel roofs, creating a much different look from the multiple gable roofs. Some have stone arches over windows and porches and other features borrowed from Tudor, Gothic Revival, and Stick styles. At times it may seem that the only thing Shingle houses have in common is the material used for their siding, but even this characteristic is not consistent. Wall surfaces could by wavy or patterned shingles, or even roughhewn stone on the lower stories. Even Frank Lloyd Wright was influenced by the Shingle Style. Built in 1889, the Frank Lloyd Wright Home in Oak Park, Illinois was inspired by the work of Shingle Style designers McKim, Mead and White. With this much variation, can it be said that "Shingle" is a style at all? Technically, the word "shingle" is not a style, but a siding material. Victorian shingles were usually thinly cut cedar which was stained rather than painted. Vincent Scully, an architectural historian, popularized the term Shingle Style to describe a type of Victorian home in which complex shapes were united by a taut skin of these cedar shingles. And yet, some "Shingle Style" homes were not sided in shingles at all! Professor Scully suggests that the Shingle style home need not be made entirely of shingles — that indigenous materials often included masonry. On the western end of the Île de Montréal, the Senneville Historic District National Historic Site of Canada includes a number of mansions built between 1860 and 1930. This "farm" house at 180 Senneville Road was built between 1911 and 1913 for McGill Professor Dr. John Lancelot Todd (1876-1949), a Canadian physician most famous for his study of parasites. The stone estate has been described as both Arts & Crafts and Picturesque — both movements associated with the Shingle house style. The Scottish architect Richard Norman Shaw (1831-1912) popularized what became known as Domestic Revival, a late Victorian-era trend in Britain that grew out of Gothic and Tudor Revivals and the Arts and Crafts Movements. Now a hotel, Grim's Dyke in Harrow Weald is one of Shaw's best-known projects from 1872. His Sketches For Cottages and Other Building (1878) was widely published, and no doubt studied by the American architect Henry Hobson Richardson. Richardson's William Watts Sherman House in Newport, Rhode Island is often considered the first modification of the Shaw style, adapting a British architecture to become purely American. By the turn of the 20th century, major American architects with wealthy clients were buiding what later became known as the American Shingle Style. The Philadelphia architect Frank Furness built Dolabran in Haverford for shipping tycoon Clement Griscom in 1881, the same year that developer Arthur W. Benson teamed with Frederick Law Olmsted and McKim, Mead & White to build what today is the Montauk Historic District on Long Island — seven large Shingle Style summer homes for wealthy New Yorkers, including Benson. Although the Shingle Style faded from popularity in the early 1900s, it saw a rebirth in the second half of the twentieth century. Modern day architects such as Robert Venturi and Robert A. M. Stern borrowed from the style, designing stylized shingle-sided buildings with steep gables and other traditional shingle details. For the Yacht and Beach Club Resort at the Walt Disney World Resort in Florida, Stern consciously imitates sedate, turn-of-the-century summer homes of Martha's Vineyard and Nantucket. Not every house sided in shingles represents the Shingle Style, but many homes being built today have classic Shingle Style characteristics — rambling floorplans, inviting porches, high gables and rustic informality. Who Was America's First Architect?